Potassium in forages . . . why does it matter? The author is assistant professor, department of dairy science, Virginia Tech. Anionic salts are typically incorporated in feed rations for close-up dry cows. By inducing a metabolic acidosis (nothing related to ruminal acidosis), the inclusion of anionic salts in diets for close-up dry cows stimulates calcium metabolism, therefore diminishing the incidence of clinical and subclinical hypocalcemia during the transition period. The National Animal Health Monitoring System (USDA, 2014) reported in their latest dairy survey that there is a growing tendency to include anionic salts in diets for close-up dry cows to prevent hypocalcemia. According to the document, 27.6 percent of the surveyed operations use anionic salts. Inducing a metabolic acidosis causes the blood to become slightly acidic. When more acidic conditions are accomplished, the absorption of calcium in the intestine and the release of calcium from the bones is stimulated. The result is elevated blood calcium concentrations. In nutritional and chemical terms, metabolic acidosis is induced when the anion equivalents from chlorine and sulfur are greater than the cation equivalents from sodium and potassium. In lay terms, diets that contain greater equivalent amounts of chlorine and sulfur than equivalent amounts of sodium and potassium are considered anionic diets, which will likely induce metabolic acidosis. The balance of these four elements is known as the dietary cation-anion difference (DCAD), and the units are expressed in milliequivalents (meq) per kilogram (kg) of dry matter (DM). Depending on the concentrations of the different minerals, the DCAD can be positive or negative. A negative DCAD implies that the amount of anion equivalents is greater than the amount of cation equivalents. When formulating diets for close-up dry cows, the goal is to reach a negative DCAD that ranges between -100 and -150 meq per kg DM. As mentioned before, anionic salts are included in rations for close-up dry cows to make the diet anionic and, therefore, induce a metabolic acidosis to stimulate calcium metabolism. 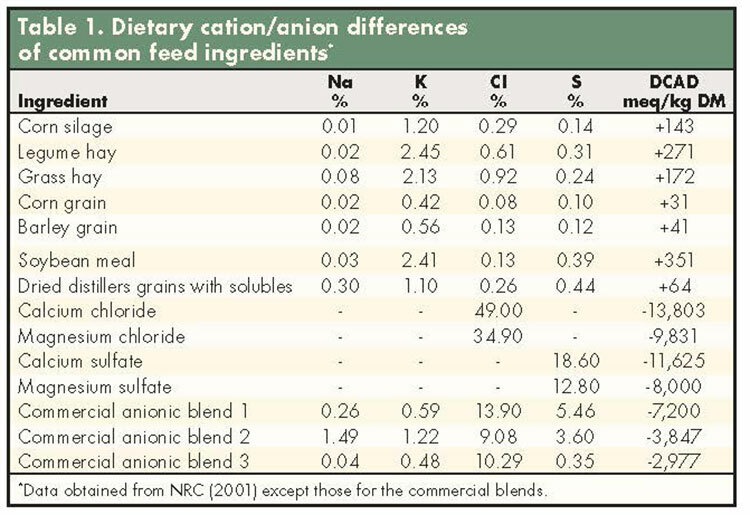 As depicted in Table 1, feeds commonly fed to dairy cattle contain positive DCAD values, while anionic salts or commercial blends of anionic salts have very negative DCAD values. For at least two reasons, potassium can never be ignored when referring to DCAD and anionic diets for close-up dry cows. The first reason is that potassium is one of the four determinants of the DCAD, which means that diets with high concentrations of potassium are less anionic than diets with low concentrations of potassium. The second reason is that, after carbon, hydrogen and nitrogen (main elements in proteins, lipids, and carbohydrates), potassium is the element with the largest concentration in feeds and forages (Table 1). This means that, depending on the composition of the diet and on the potassium concentration of its ingredients, a DCAD between -100 and -150 meq per kg DM might not be possible to accomplish despite the use of anionic salts or commercial blends of anionic salts. As an example, the very high concentration of potassium and, therefore, high and positive DCAD, of legume hay (see Table 1) is a reason for avoiding the inclusion of this type of forage in diets for close-up dry cows. As forages are the major components of diets for close-up dry cows, the concentration of the main ions in forages should always be determined by a laboratory analysis to obtain an adequate DCAD. 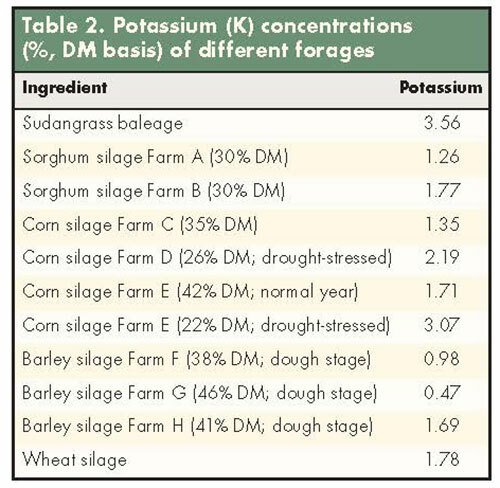 Even though they are typically aware of the high concentrations of potassium in legume-type forages, also be aware that certain grass-type forages, such as sorghum silage or baleage (especially sudangrass), or drought-stressed corn silage (Table 2) can also have very high concentrations of potassium. As most of the potassium is contained in the vegetative stover of the plant and not in the grain, drought-stressed corn silages containing little proportions of grain can have atypically high concentrations of potassium. Keep in mind that when including forages with very high potassium concentrations in diets for close-up dry cows, it might be very difficult, independent of the anionic salt or anionic commercial blend utilized, to obtain a negative DCAD capable to induce metabolic acidosis . . . it is simply a matter of math! This article appeared in the February 2017 issue of Hay & Forage Grower on pages 14 and 15.